LinkedIn does not automatically add any incoming endorsements to your profile; you must accept those endorsements first. When you receive an endorsement, it appears in your Notifications list at the top right corner of the LinkedIn screen, and you also receive an e-mail (depending on your e-mail settings) letting you know who endorsed you and for what skills. 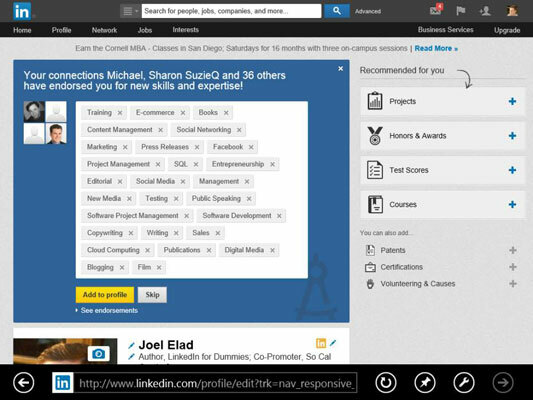 The easiest way to accept (or reject) these endorsements is to edit your LinkedIn profile. Hover your mouse over the Profile link in the top navigation bar, and then click Edit Profile from the drop-down list that appears. You can also respond to the Notification message that LinkedIn sends you, which takes you to the Edit Profile screen, too. When your profile comes up for editing, you should see a blue box indicating that your connections have endorsed you for skills and expertise. Click the gray Skip button, or the X in the top right corner of the blue box, to ignore this and deal with it later. Click the See Endorsements link to see who endorsed which skills. If you decide to add these endorsements to your profile, LinkedIn offers you the chance to give endorsements to people in your network. After you’ve accepted the endorsements, an optional step is to contact the person or people that endorsed you with a quick note to say thanks. Not only does it give you a valid reason to stay in touch, but it helps cultivate the relationship. You can also visit their profile page and decide to reciprocate by endorsing some of their skills.